Come behind the scenes with me for my shoot with Valentino Handbags. It's such an dream to work with this brand. We always get to travel to fun locations in the wintertime. Last season we went to Miami for our Cuba inspired photo shoot. This time we shot on location in the Hollywood Hills area of Los Angeles. CREW CREDITS: Produced by the team at Jodi Jones Studio. Photographer/Art Director Jodi Jones, Cinematographer Adam Rodriguez, Video Editing Adam Rodriguez, Wardrobe Styling Yanyanista, Models Jessica Wall with Ford Models LA, Katty Ukhanova with Wilhelmina Models LA, Makeup and Hair by Luna Mariposa, Jonas Tamir Valentino Handbags USA, Assistants Irina Kulik and Evgeniy Kirichenko. PINK FLAMINGOS AND AN AIRSTREAM! My very Miami backdrop for my Wonderland shoot. Last week, I flew down with my stylist, Yanyanista, to sunny Miami, and spent time shooting at Miami Ad School, which was perfect for our concept of “dreamland”. The idea for the images was planned initially by making a creative mood board, styling concepts, casting our models and booking local Miami makeup and hair. We wanted an unusual setting with surreal elements. I shot this with a Phase One XF 100MP and we tweeked the colors in Capture One. The inspiration was very natural. We planned the shoot based on magical creative backdrops similar to Alice in Wonderland. Not your usual locations. Location was to be set outside because we were fortunate to be shooting in wonderful warm Miami. We had really interesting backdrops of graffiti, a bull, flamingos, large pink buildings, greenery, and an air stream trailer. “The style is the essential part of the storytelling. When we found the location, I knew that something bazaar was going to be created there. Ideas were flooding in my mind. I immediately thought of one of my best friends, couture designer Anthony Manfredonia, and his gorgeous Rose Collection. I also thought of using cute headpieces from Ayuko H. Millinery and silk gowns from Manuel De la Cruz. I contacted the designers and they were super excited for the ideas!” stated Yanyanista. We had stepped onto a plane in NYC at 40 degrees Fahrenheit and stepped off to a perfect 80 degrees in Miami. We had so much fun. Thanks for meeting up with me on my Master Class tour! Last year I teamed up with Phase One to offer an exciting and unique opportunity to learn how to create beautiful images with one of my favorite fashion stylists, Yanyanista. We shared our knowledge about the fashion industry. Here is a fun video from our Miami workshop! Thank you to everyone who came out to join us!! Love you guys!! Excited and honored to be asked to speak at Microsoft this evening on the Business of Fashion with Yanyanista and the Haute House University. We will be speaking with a panel of experts @themartinifactory and @alexvinash on building a successful fashion business. Photo by Matt Officen at NYFW. Come join us tonight at 6pm! Its a free event! 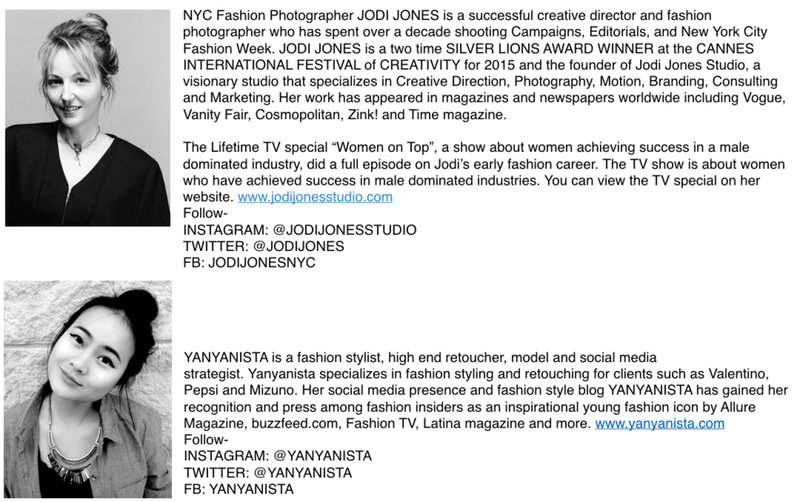 I have a team of 4 photographers this year who are getting that awesome lifetime experience of shooting New York Fashion Week Runway Shows for the first time. Three of the photographers are students from my recent Master Class in Los Angeles and one is a young photographer that I met while on assignment in Australia. I have invited this select group to join me this fashion week, and go out on assignment and have a blast learning the ropes of runway photography. They are all extremely talented photographers in their chosen field of photography but total newbie runway photographers. We have Matt from Australia, Annie and Stephanie from Los Angeles, and Mark from San Francisco. Be sure to check back here daily and on social media to follow in their exciting journey as first time runway photographers. Matt who arrived from Australia yesterday has been helping me to organize the crazy fashion week schedule for the team. It involves credentialing with the pr companies and fashion designers, putting together a spreadsheet of a daily list of shows, and then an assignment calender for each photographer. I am having the photographers cover both "street fashion" before and after the shows, as I really feel that is an exciting area of fashion week to photograph... to get a glimpse at the way fashion industry people (and those who aren't in the industry, but who are fashionistas in their own right)... how they dress to attend the shows. When shooting street fashion, you can literally shoot with any camera, even an iPhone. But when shooting the runway shows there's certain gear that does make the photograph better. So lets venture into this world of runway photography, and come into the pit with me, as I take you with us on this journey. If you, the reader, are interested also in shooting runway this season, I offer here some really great suggestions that I have learned over the years. I started out shooting film in the pit at NYFW over 20 some seasons ago. Tips for great runway shots: I would suggest having some sort of hard case, like a pelican case or a "turtle." This is pretty important. You will want this to sit on while you were shooting the show and it works great to establish your territory, as the pit is a very hard place to sit in. Without anything to sit on you will most likely have your legs fall asleep halfway through the show which has happened to me a dozen times. Then you try to get up after shooting a show and you've got rubber legs ? and look like a total dork. Remember, you are also trying to look cool as this is fashion week, and rubber legs don't look so chic. Now you could always stand up in the back of the pit, but then again when I shot the Mark Jacobs show it was a complete madhouse with Lady Gaga, J-lo, everyone was there. I had to bring with me a six-foot ladder to the show. The taxi driver did not want to pick me up with my big ladder but I made him and he drove with half of it sticking out the window! I placed on top of that ladder a pelican case duct taped to it on the top step, then ducked taped to that was a turtle stand (on top of all that!) just to get an inch view between two people's heads to get a shot of the runway. My assistance's job was literally to stand behind my ladder and hold it so I didn't die. No lie. I would not suggest starting out shooting a Marc Jacobs show for this very reason. As glamorous as it sounds believe me that it is the last place you want to be as a newbie. Start off easy and slow with some of the easier less popular shows. For most convenience it's best to sit on a case down in front instead of trying to stand in the back. When you shoot high you get the look of a very expansive runway and the venue seems larger than it really is in the photograph. When you shoot low from down on the floor, you make the models more statuesque and it is a very intimate feel. A benefit of shooting low is that you could easily run to the next show if you're in front, but from the top back part of the pit, you have to wait for everyone first who's in front of you to move. Of course some of the smaller shows it's a piece a cake to stand in the back it just depends on how popular the show is. When shooting a long runway show it's best to have a very fast lens which is something like A 70 - 200 f2.8 IS lens w a rotating monopod/tripod ring. If your lens is slower like a 5.6 in speed it's just gonna be a little bit more difficult. A fast camera helps too. If I'm shooting the big runway shows that are professionally lit with million-dollar lighting then I usually have the following settings: 640 ISO, f4, at 250/sec. Always always always manual settings. If you find that it's too dark or too light then you can easily change and either make your shutter speed a 200 or bump up the iso to 800 on any of the advanced low light cameras. Or if it's too bright, can you can always make a shutter speed faster. I find if you go over 500th of a second shutter speed, you get the models in really weird expressions. I also never hold my finger down and just let it rapid-fire. I see a lot of professional photographers from the biggest organizations doing that and I understand why they're doing it but I always prefer to shoot for the moment. Part of the fun is about anticipating what's about to happen a second before it happens live and getting that perfect timing of the front of the foot hitting the ground. It's what makes it exciting and artistic. You anticipate that moment when her hair is going to bounce or you sense the beautiful flowing fabric of her gown is just about to move in a way that is just extraordinarily beautiful and that's when you take a shot. And these models do this on purpose... they know how to use their body and their arms to create magic. It's the excitement with the music when they're walking down the runway and timing that shot. Don't be lazy and just take every single shot. Be creative! Also when I walk into a venue I can usually tell within the first 10 seconds of what the color temperature of the light will be even though they haven't turn the lights on. That just comes from experience and knowing the kind of lights that are mounted to the ceiling. You will manually want to set your color temperature in kelvins. 3150 - 3400 is usually right around the color temperature that most of the shows will be. That is your typical tungsten lighting. Occasionally I'll going to a show and then I'll be spotlights for instance Betsey Johnson always use the spotlight. Those are daylight spots around 5500 to 5600 kelvin. When in doubt find house video and ask them what the color temperature is. They are usually in the venue when they do run-throughs before they let the rest the photographers in and they have to know this color temperature especially if they're shooting live for the world to see. B video is usually the house video team. Sometimes I'll just ask them just to confirm what I believe is true. It's astonishing to me how many times I've seen the photographer next to me shooting blue pictures not realizing that they have to change their color temperature from when they were just shooting a celebrity in the front row with their flash five minutes before the show started. Without a doubt most smaller offsite shows do not have as bright of lighting as the big fashion shows . In the big fashion shows you never ever ever need to use flash to shoot a runway show. That is just for the movies to make the pit seem more exciting. The only time I ever had to use flash is at small offsite shows where they do not have professional lights and the runway has dark spots, meaning they have a bright spot and then shadowed spot on the runway walk. Its just crazy. Occasionally on very long runways you will find that the very start of the runway which technically is that the back where the models just walk out from backstage.., that sometimes is about one-stop darker then towards the front of the runway. But what I sometimes do is open up to f3.2 or f2.8 for the first shot and then close it down to about f4 once the model is about one third of the way out onto the runway. Well that's about all for now. If any of you are thinking of shooting the runways this season and have any questions or need any more advice on gear or even the more difficult task of getting that "center spot", feel free to connect with me personally. Be sure to check back here daily and on social media to follow in their exciting journey as first time runway photographers. COUNTDOWN… 10 days till Nashville! Hey, can we hitch a ride with you to Nashville? It’s no wonder Blake Shelton, Taylor Swift, Johnny Cash, Dottie West, Toby Keith, Kings of Leon, and SO many more artists have their roots from Nashville. I look forward to this exciting trip to Nashville, and seeing many of my cool friends that live there, like our talented and beautiful model Esseri, whom we will be photographing on our Master Class that we are teaching while there. She is THE Esseri Holmesof iHeart Media Nashville and 105.9 TheRock. She is just amazing!! We are going to create some beautiful images with her! I can just picture myself and my Stylist Yanyanista sitting in an amazing venue, enjoying the great music, and feeling the warmth in the atmosphere. Nashville simply oozes character, and one can only imagine the creative inspiration from shooting there. It would be fun to host a party, invite our students and all our cool musician friends like Taylor Swift, right?! Yanyanista was already coming up with ideas like "We should have a road trip driving down there from NYC”. We started to talk about creative photoshoots we could do on the road-trip, how Yanyanista was going to dress the model, and what kind of great places we would like to visit. When music, fashion and art come together, we know something beautiful will be created! Nashville reminds us of friendly people, killer country & blues music, celebrities, Jack Daniels, bbqs, and tour buses. That is why our excitement has developed into showing you this photoshoot of us “road-tripping” to Nashville. Not ones to miss out on the silliness of road trips we take full advantage of very opportunity to “ham it up” on the way! I want thank Phase One, Profoto, Capture Integration, and West Light Studios for this incredible opportunity to have my next photography Master Class there in Nashville in 10 days! I am grateful that I can travel to places I love, share my knowledge, skills, experience, and inspire other creative minds such as you, with my best friend and creative partner: the super talented fashion stylist and high-end retoucher Yanyanista. Where is your favorite thing to do in Nashville? Let us know! For more details on our super awesome Nashville Master Class, please go here: http://jodijonesstudio.com/nashville. I recently attended the NAEEM KHAN runway show for New York Fashion Week. What a stunning collection. Wouldn't you just love to wear one of these stunning pieces?! SUN DRENCHED GARDENS OF THE SOUTH OF FRANCE. BOUGAINVILLEA STREWN WHITE WASHED WALLS OF THE MEDITERRANEAN. AZURE BLUE WATERS OF CAPRI AND THE SOFT PALETTE OF THE FRENCH IMPRESSIONISTS. ICONIC MUSES OF THE 50’S AND 60’S SOPHIA LOREN, GRACE KELLY, BRIGITTE BARDOT, JACKIE KENNEDY.